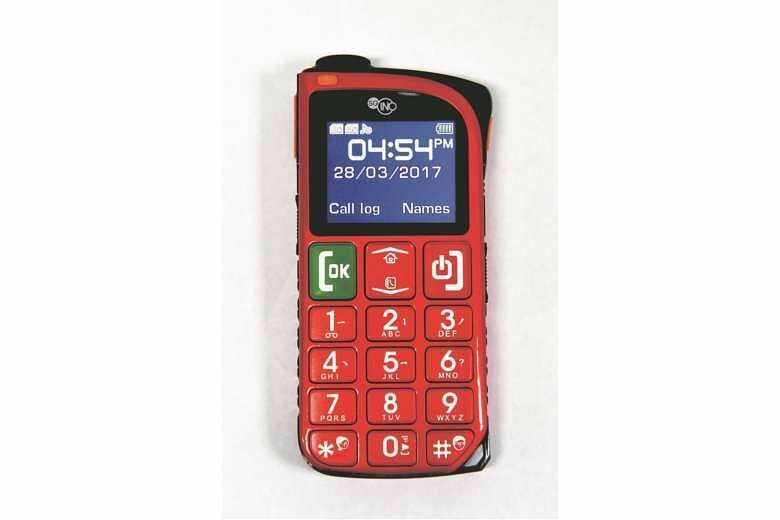 3G feature phones - basic and inexpensive handsets with a small display and a numeric keypad - have largely been replaced by budget smartphones. But they still matter - especially for thousands of mobile phone users here switching from 2G services. There are just three days to go before 2G voice and messaging services in Singapore are shut down for good on April 1. But, as recently as a month ago, there were still up to 123,000 lines on the 2G network, according to the Infocomm Media Development Authority (IMDA). This is down from the 160,000 lines reported in November last year. Most current 2G users are migrant workers and seniors. To avoid losing the use of mobile services, they have to switch to a 3G or 4G handset before the deadline. IMDA says the existing 2G airwaves will be reallocated to improve the speed and capacity of newer, higher-speed mobile services. Japan and South Korea unplugged their 2G networks in 2012 while Australia is currently in the midst of doing so. According to market research firm GfK Asia, close to 18,000 units of 3G feature phones were sold in Singapore monthly in December last year and January this year. This was up slightly from the roughly 16,000 and 15,000 units in October and November last year respectively. But, overall, the feature-phone market declined around 32 per cent year-on-year when comparing Q4 2015 and Q4 2016. They account for just 3.2 per cent of all handsets sold in Singapore. Local firm Foresight Manufacture, best known for producing handsets designed for seniors, says it has seen a "40 per cent increase in 3G phone sales in the past three months". 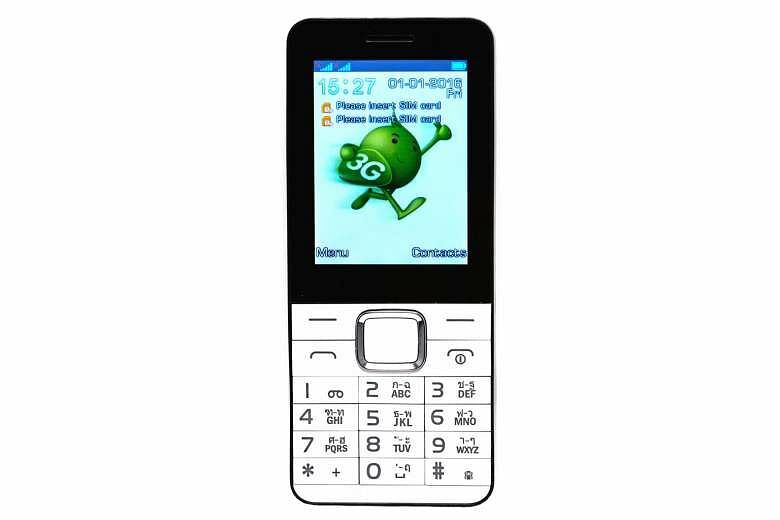 Its senior phones, first launched in 2009, come with large buttons and large fonts, as well as an SOS emergency button. The company also sells 3G and 4G phones under the SGIno brand. Its latest Simple 3G phone for seniors is available from Singtel. The telco says it has received more queries about 3G feature phones recently and will be adding more models in the next couple of months. StarHub, which sells the SGIno 3G Basic, says it is working hard to restock popular 3G feature-phone models at its roadshows held at foreign-worker dormitories and at selected SingPost outlets. "Sales of 3G feature phones, as well as our $0 3G and 4G smartphones, have grown in the run-up to the 2G network closure," says an M1 spokesman. Madam Goh Siew Eng, 59, bought a SGIno phone for seniors earlier this month to replace her 2G phone. But she intends to use her older phone till April: "I am still not familiar with the new phone. When other people send me an SMS, I don't know how to read it." Retiree Roy Yeo, 70, switched to a budget smartphone last year, but would rather use a feature phone. However, his wife Jenny Tan, who uses a smartphone, cannot imagine going back to feature phones. "I use my phone mainly to stay in touch with my children through WhatsApp and Facebook," she says. She even catches up on Korean dramas using a video streaming app. "But I still do not know how to use e-mail," she adds with a laugh. You will have better luck buying 3G feature phones at mobile phone shops in your neighbourhood than larger chain stores. Challenger, for instance, does not carry any models. You can also buy them at e-commerce sites like Qoo10 and Lazada. Most of these handsets are imported - the warranty and aftersales service are provided by the seller. Online sellers often do not provide a warranty - you may get a month's coverage, at best. Mobile phone shops in Singapore may offer warranties of six months to a year, but the same handset costs more than if purchased from online sellers. Feature phones come in candy bar, slider and even clamshell form factors. They have small non-touch displays. Standard features include a calculator, alarm clock, calendar and music player. But they do not support Wi-Fi and have limited mobile data services. In other words, SMS, not WhatsApp, is what you'll use. Surfing the Internet is possible on most models, but it is a hassle. On the other hand, these phones have much better battery life than smartphones because of their small screens and limited features. The revamped Nokia 3310 announced last month will not be sold in Singapore because it is a 2G phone. 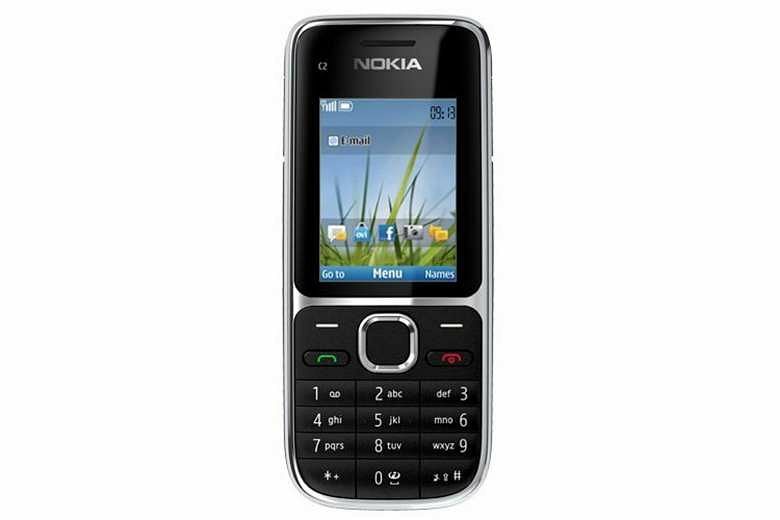 But the 3G-capable Nokia C2-01 is available at local stores for around $80 if you want a candy-bar feature phone. It even has Internet connectivity via the General Packet Radio Service, or GPRS, standard. Browsing the Web using the built-in Opera Mini browser, however, is a test of patience, as Web pages load slowly. Be prepared to scroll constantly while reading because of the phone's small 2-inch (240 x 320 pixels) screen. Viewing angles are relatively poor compared with some of the other phones here. Pressing the Menu option displays a grid of icons, each representing a feature. But the icons and their fonts are small. Besides English, it supports Malay, Tamil and Simplified Chinese. While I would not recommend using them unless you really have to, the phone actually has a dedicated Facebook app, as well as an e-mail client. The built-in music player is decent enough - it supports multiple formats like MP3 and WMA, as well as playlists. And it can sort your tracks by artist album and genre. It has a 3.2-megapixel rear camera, unlike other feature phones that either lack one or have a crummy camera. You can even shoot videos, though the quality is akin to an animated GIF. Photos can be saved to the phone's 64MB internal storage, microSD card (up to 16GB) or sent to other devices via Bluetooth. Phone calls are clear and audible while the phone's ringtone is unmistakably loud. For those who want a more capable feature phone, the Nokia C2-01, which cost me $78, is a pretty solid choice. The Newings W200 Ola Fun 3G phone comes with dual SIM support, making it suitable for travellers who need a basic phone. Only one of the SIM slots supports 3G - the other 2G slot is useful only in places outside Singapore. It has the largest display in this roundup with a 2.4-inch (320 x 240 pixels) screen. It is bright, too, but the vertical viewing angle is terrible. The screen size makes a difference when navigating its interface. The fonts are larger than other phones'. However, using its built-in browser is just as clunky as other feature phones - typing in an URL using the numeric keypad takes too much effort. Don't be fooled by the Facebook icon. It is simply a browser shortcut that opens the social media website rather than a dedicated app. Its plastic chassis feels cheap. It is a bit rougher than the other phones here. The white plastic back also gets scuffed and picks up dirt easily. The keypad has a blue backlight, but not all the keys are evenly illuminated because the backlight is not embedded centrally. Call quality is on a par with that of other phones. It sounds clear even when the other side is speaking from a noisy canteen. Its 0.3-megapixel camera takes dark and grainy images. Photos can be delivered via Bluetooth or a micro-USB cable to another device. They can also be stored in a microSD card (up to 8GB). It does not come with any games, but multimedia features like the FM radio and an audio player should keep you entertained. There is a video player but I cannot imagine anyone watching a video on such a small screen. The phone costs $75 (with a one-year warranty). I have seen it being sold at a much lower price online, but without a warranty. 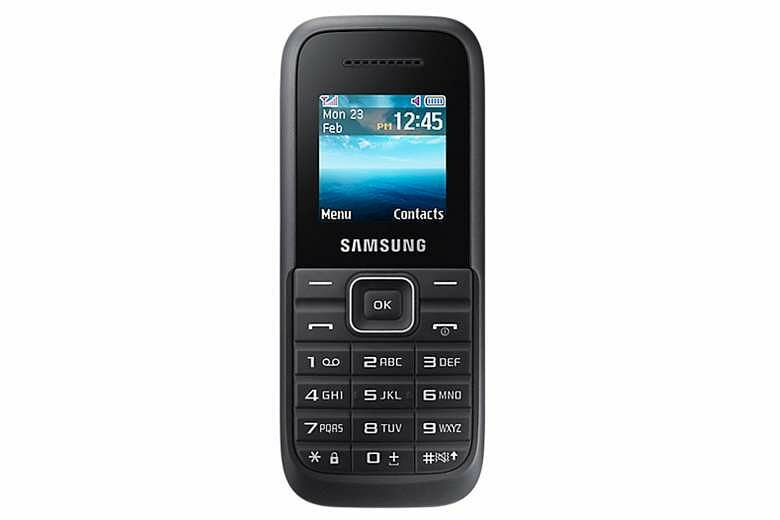 The Samsung Keystone 3 (B109H) is very much a typical candy-bar feature phone. Its 128 x 128-pixel screen, which measures just 1.5 inches diagonally, is the smallest among the four phones tested here, though the phone itself is about the same size as the Nokia C2-01 (2-inch screen). The version I bought appears to be designed for the South-east Asian market - in addition to English, it supports languages like Bahasa Indonesia and Malay, but not Chinese. The keys are soft with a rubber- like finish and they are backlit, too. Call quality is good - I could hear the other party clearly without much ambient noise. The phone's 4MB storage stores up to 1,000 contacts as well as 1,000 SMS messages. At the top of the phone is the 3.5mm audio jack and a small torch. The micro-USB charging port is on the right. Standard features like a stopwatch, calculator and alarm are included. But it has no camera. It does not support mobile data, so if you need to kill time, your best bet is the pre-installed Sudoku game or the FM radio. With a street price of $68, it is the cheapest phone in this roundup, but the Keystone 3 may not be for everyone as it lacks some features, such as a camera and Chinese-language support. 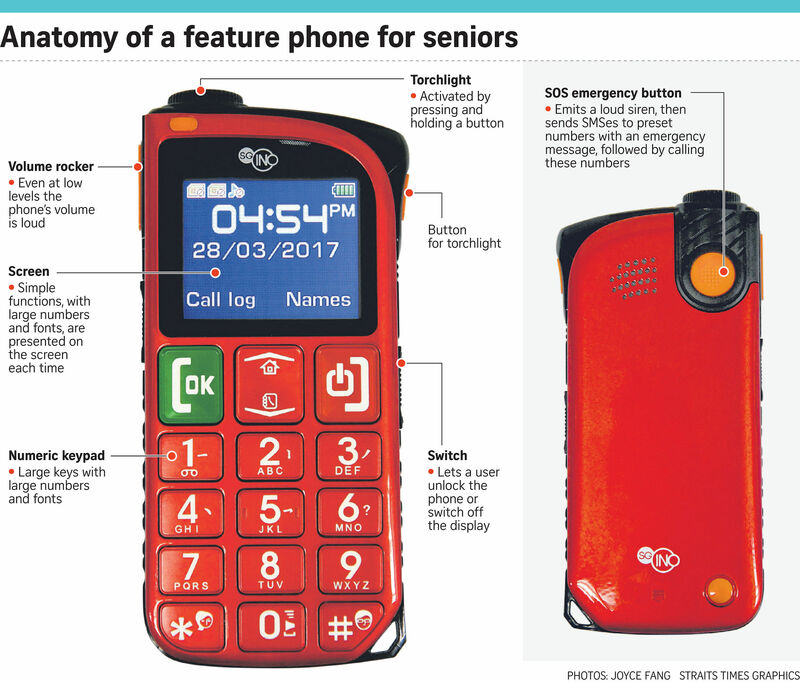 Unlike the other feature phones reviewed here, the SGIno Simple 3G (see graphic below) is designed for the elderly. Hence, it has large buttons and large fonts to help those with poor eyesight. Its speakers are louder than usual so users won't miss any phone calls. In addition, it has an SOS button at the back. Press and hold it for the phone to emit a loud siren. Then it will send out emergency messages to a list of preset phone numbers, followed by the dialling of these numbers. A useful feature for the absent-minded: a medication reminder setting to alert you to take your pills. The round bump at the top is the torch. Press and hold a button at the side to turn it on - there is no need to fiddle with menu settings. Slide a handy switch at the side to lock the phone against accidental key presses. Slide it the other direction to unlock it without having to press multiple keys, like in other feature phones. I found calls to be muffled, compared with the other phones, which could be an issue for the hard of hearing. The Simple 3G has two SIM-card slots. Only one of these is 3G-capable - the second SIM supports 2G networks. It comes with a rudimentary Web browser with preset shortcuts for Facebook and YouTube. But, obviously, the experience is sub-par with the phone's small 1.77-inch (128 x 160 pixels) screen and slow Internet speed. At $88, it is reasonably priced for its unique features that cater to elderly users.